In the first inning, the Mariners got on the board against Tim Lincecum. Normally I would call this an amazing feat in and of itself, 1. because Lincecum is a former Cy Young Award winner and 2. because the Mariners haven't been scoring runs in games until about the 7th inning or later. Today was different. 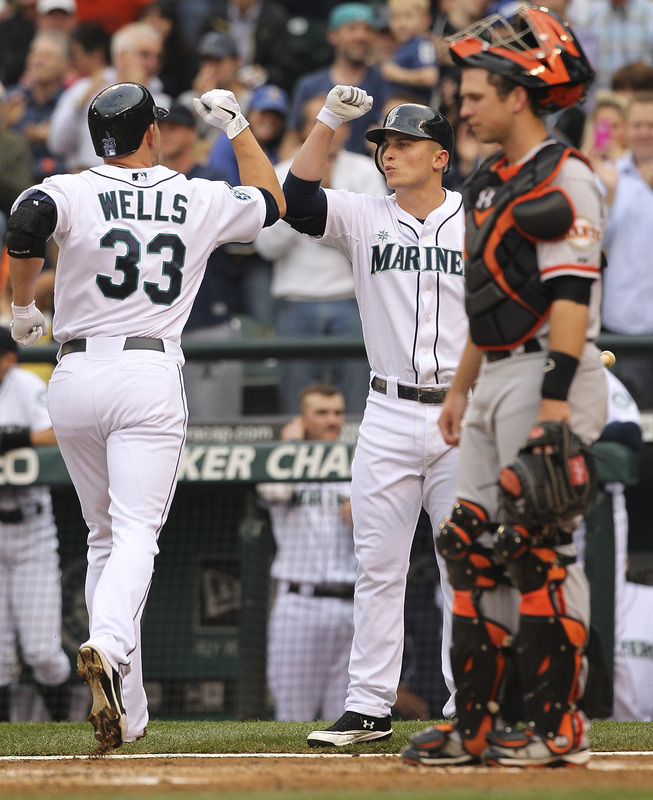 First, Casper Wells hit a solo shot into the visiting bullpen in left center field to put the Mariners up 1 to 0. 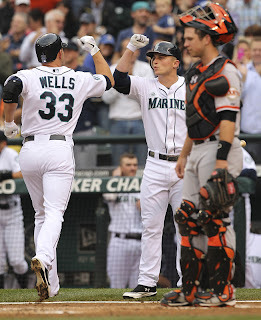 It was a no doubt homerun that Wells made look easy. Then, as if to one up his teammate, Jesus Montero came up to the plate and launched a 1-2 change up into the upper deck in left center. Upper deck! Montero got all of it and watched it fly, fly away and made the score 2 to 0. The lead was short lived however, as the Giants battled back to score 2 runs in the third inning and another 2 in the fourth. Kevin Millwood was not having the same success against the Giants as he did versus the Dodgers last week when he threw 6 innings of no-hit ball. That would be all Millwood would give up, but he was done after just 5 innings. In the bottom of the 5th the Mariners came back to tie the game. Dustin Ackley led off with a single and John Jaso followed with a walk. Then, everything I've been waiting for happened. Brendan Ryan laid down a sac bunt and moved the runners over to 2nd and 3rd. With two runners in scoring position, Ichiro Suzuki came to the plate.... and hit a single, scoring Ackley and moving Jaso to third. Jaso would end up scoring on a wild pitch by Lincecum and the game was even at 2. The bottom of the 6th, the Mariners kept rolling. With Lincecum still on the mound, Jesus Montero hit a lead off single to left field to put an end to the Freak's night. Jeremy Affeldt came in to face Michael Saunders and allowed a single to him before getting Justin Smoak to pop out. Dustin Ackley hit another single and the bases were now filled with Mariners. Eric Wedge decided to pinch hit Franklin Gutierrez for John Jaso, who normally would be used as a pinch hitter. Guti stepped up to the plate and hit a shot down the line that was gloved by Joaquin Arias but wasn't able to make a play and all the runners advanced as Montero scored. That 5th run, charged to Lincecum. Then came Brendan Ryan. Ryan slapped a single up the middle that almost took out the pitcher and brought in Saunders and Ackley to score for a 7 to 4 Mariners lead. The Mariners ended up with a total of 12 hits on the night. That's more hits than the rest of this home stand combined. Not really, but I bet you wanted to look that up, right? Montero had 3 hits, Wells, Ackley and Ryan all had 2. The only Mariners player to not reach base was Kyle Seager. He has struggled as of late and is hitting a mere .152 in his last 10 games. A great day for the M's, a better day for the offense. I would really hope that this is something to build off of and use for future games at Safeco Field. Casper Wells said it before and I hope he said it again today to the rest of the lineup. "Who said it's hard to hit at Safeco Field?" I think he may have said that to Montero as he went back to the dugout. The Mariners did have only 2 hits through the first 4 innings, but they obviously figured something out. We can only hope that this establishes some momentum here at home. My hope is that Wedge will decide to use the sacrifice a little bit more than what we've seen so far. All in all, a great game and a great end result for the M's. Tomorrow we have the opportunity to win the series as we send Felix Hernandez to the hill versus Madison Bumgarner. It should be a tremendous pitchers duel, but Felix has to come back to being the Felix of old and dominate the Giants. Let's hope that he can shine on Father's Day!